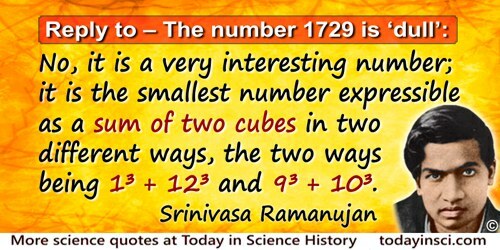 Replying to G. H. Hardy’s suggestion that the number of a taxi (1729) was “dull”: No, it is a very interesting number; it is the smallest number expressible as a sum of two cubes in two different ways, the two ways being 1³ + 12³ and 9³ + 10³. Proceedings of the London Mathematical Society (26 May 1921). A fact is a simple statement that everyone believes. It is innocent, unless found guilty. A hypothesis is a novel suggestion that no one wants to believe. It is guilty until found effective. Edward Teller, Wendy Teller, Wilson Talley, Conversations on the Dark Secrets of Physics (1991, 2002), Footnote, 69. A mind exclusively bent upon the idea of utility necessarily narrows the range of the imagination. For it is the imagination which pictures to the inner eye of the investigator the indefinitely extending sphere of the possible,—that region of hypothesis and explanation, of underlying cause and controlling law. The area of suggestion and experiment is thus pushed beyond the actual field of vision. In 'The Paradox of Research', The North American Review (Sep 1908), 188, No. 634, 425. 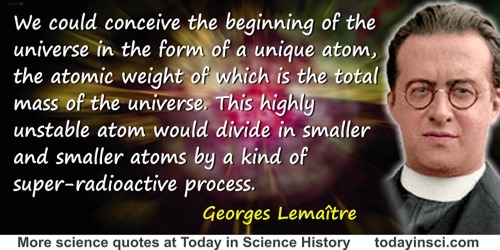 All things are made of atoms—little particles that move around in perpetual motion, attracting each other when they are a little distance apart, but repelling upon being squeezed into one another. In that one sentence ... there is an enormous amount of information about the world. 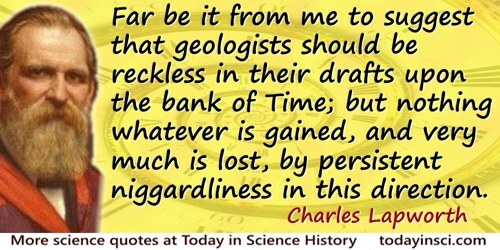 His suggestion that the most valuable information on scientific knowledge in a single sentence using the fewest words is to state the atomic hypothesis. I suggest that the best geologist is he who has seen most rocks. The Granite Controversy: Geological Addresses Illustrating the Evolution of a Disputant (1957), 3. I thank God that I was not made a dexterous manipulator, for the most important of my discoveries have been suggested to me by my failures. In Joseph William Mellor, Modern Inorganic Chemistry (1927). Quoted earlier in books by Samuel Smiles. From Novum Organum (1620), Book 1, Aphorism 2. Translated as The New Organon: Aphorisms Concerning the Interpretation of Nature and the Kingdom of Man), collected in James Spedding, Robert Ellis and Douglas Heath (eds. ), The Works of Francis Bacon (1857), Vol. 4, 47. The world little knows how many of the thoughts and theories which have passed through the mind of a scientific investigator, have been crushed in silence and secrecy by his own severe criticism and adverse examination; that in the most successful instances not a tenth of the suggestions, the hopes, the wishes, the preliminary conclusions have been realized. In 'Observations On Mental Education', a lecture before the Prince Consort and the Royal Institution (6 May 1854). Experimental Researches in Chemistry and Physics (1859), 486. There is more than a germ of truth in the suggestion that, in a society where statisticians thrive, liberty and individuality are likely to be emasculated. Who could have believed that … the introduction into the human body of a small particle of matter from a cow’s udder might be the means of saving thousands of human lives? We learn from these and innumerable similar instances that the highest truths lie hid in the simplest facts; that, unlike human proclamations, nature’s teachings are not by sound of trumpet, but often in the stillest voice, by indirect hints and obscure suggestions. From Address (Oct 1874) delivered at Guy’s Hospital, 'On The Study of Medicine', printed in British Medical journal (1874), 2, 425. Collected in Sir William Withey Gull and Theodore Dyke Acland (ed. ), A Collection of the Published Writings of William Withey Gull (1896), 109. 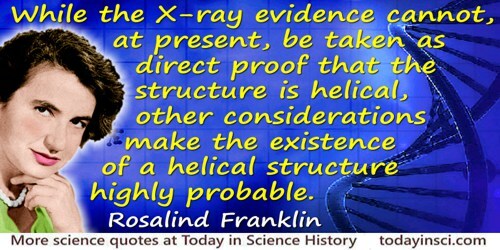 Why should an hypothesis, suggested by a scientist, be accepted as true until its truth is established? Science should be the last to make such a demand because science to be truly science is classified knowledge; it is the explanation of facts. Tested by this definition, Darwinism is not science at all; it is guesses strung together. In chapter, 'The Origin of Man', In His Image (1922), 94. [About a conference on Systematic Biology] Many interesting statements were made that apply directly to the work of taxonomists. In some cases the interest lay in the value of the suggestion and sometimes in the obvious need for rebuttal.